A complete Nauticam Sony a6500 System that has everything you need to start shooting high-quality reef and macro shots utilizing the Sony 16-50mm EZ lens. It Includes the Nauticam NA-6500 Housing, Vacuum Valve, Port 45, Kraken 24mm Wide Angle Wet Lens (M67), Kraken Float Arm, and a Big Blue 15,000 lumen Pro Tri-color Video Light. You're set to shoot high quality video and take great photos with this compact underwater a6500 system. The Sony a6500 is a great match for this high-quality, aluminum Nauticam NA-6500 housing. Depth rated to 300', Nauticam is known for ergonomics and great user experience. Key controls are placed at the photographer's fingertips. The housing is machined from a solid block of aluminum, then hard anodized making it impervious to salt water corrosion. The housing and accessories are light weight, and easy to assemble. The camera drops in without any control presetting, and lens port changes are effortless. Integrated Vacuum Monitoring and Leak Detection-Circuitry included as standard equipment provides constant monitoring of water tight integrity when combined with the included Nauticam M14 Vacuum Valve II. Redesigned Shutter Release: Based on DSLR designs, the shutter release is now an oversized lever, that's easy to reach. Patented Port Locking System- Lens ports are securely locked in place with our iconic port locking system. Stainless Steel Handle Brackets-Stiffening handle brackets are included with the housing. Flexitray Included! Tray and ball mounts along with the external shutter release are included. External Long-run Battery: Room for an optional external battery pack inside housing. This is an excellent domed, fisheye wet lens that can be added to most camera housings with a standard 67mm threaded mount. The Kraken KRL-01 fisheye conversion lens has a magnification ratio of 0.53. This will give up to 145 degrees field of view with a 24mm camera or 119 degrees with a 28mm lens (camera and housing dependent). The KRL-01 has been designed for optimum performance with compact cameras with up to 24mm (35mm camera equivalent). Vignetting may occur on some compact cameras, depending on the housing, but can be eliminated by zooming in slightly, for the most part most cameras don't vignette with this optic. Dry, inert gas is injected into the lens during manufacture. No humidity in the air space of the lens reduces any possibility of fogging to a minimum. The mount is aluminum, the dome made from optical grade acrylic. Includes neoprene cover, rear cap and padded soft case. 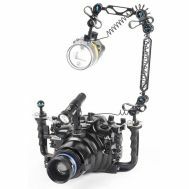 This new addition to the Bigblue Dive Lights photo/video light family offers many features making it a great choice for the pro photo/video enthusiast. It is our brightest of three dive lights that use the “Chip on Board” style LED. The VL15000P is a self-contained, compact yet powerful, all-purpose dive light—but it is best suited for video purposes with its extra-wide 160-degree beam and warm white color temperature. Utilizing “Chip on Board” technology, the VL15000P will provide a beautiful even-toned light source to make any underwater creature pop with natural color.